How are you spending the last days of August! Today we have a special surprise for you:) We have been secretly working behind the scenes on new crafting goodies that take your creativity to a whole new level and make crafting easy for you! Special Savings: For a very limited time there is a 10% discount for the I WANT IT ALL only available until September 2nd or while supplies last! Get yours today to ensure that you don't miss out on this special savings! Instructions: Score and fold the tunnel card. Cut pattern paper from Under the sea collection and coordinate with the size of card panels. Adhere the coordinating circle die and cut out the circle from each card panel. Adhere the papers with glue. Using the circle dies, cut the frames of all sizes. Apply glossy accents and add glitter. Adhere the frames to the matching circles in the card. Cut strips of cardstock and tear along the edges. Distress with archival inks and paste at the base in the inner card panels. Use the stencil and modelling paste to apply texture. Add glitter and let it dry. Stamp the images from the under the sea collection cling stamps. Colour with the Zig real brush pens according to image. Die cut with coordinating dies. Shape the images on flower shaping tool kit. Stamp hibiscus flowers using brown ink on white cardstock, die cut with coordinating dies. Color using Rose Madder and Saffron ink and shape using deluxe flower shaping kit. Stamp hibiscus leaves in Library Green ink and diecut with coordinating die. Color using Leaf Green ink and shape. Apply prills on Hibiscus flowers. Cut the border dies with white cardstock and distress with archival inks. Adhere on the top front and back. Add the images in all the panels creating a scenery. Pop up the images with foam dots as desired. Add sentiments from patterned paper. Instructions: My card is 6 X 6". To see the inside pages check out this link. Cover the card base with the paper collection and use the coordinating circle dies to cut center holes in the designer paper. Die cut scalloped circle and smaller circle on coral designer paper to create a fun circle frame. Using Rich Cocoa ink stamp the flowers and leaves, die cut with coordinating dies. Color using Morocco and Cantaloupe, New Sprout and Bamboo Leaves for the leaves. Shape using the deluxe flower shaping kit. Add the flower soft and set aside. Next using Tuxedo Black ink stamp the turtles, sea horses, and fish. 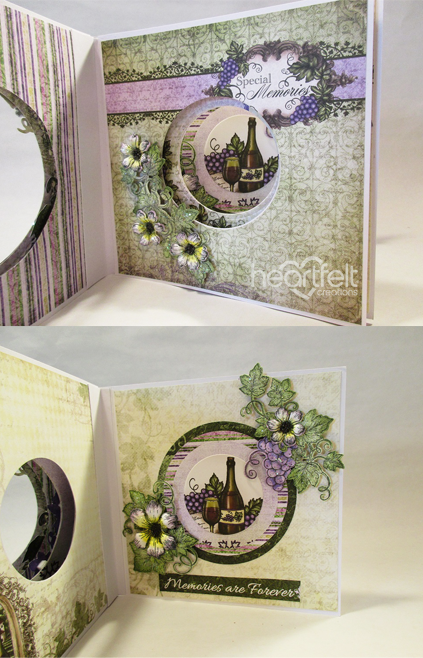 Die cut with coordinating dies and color them using various Memento and Archival inks, set aside. This is also a good time to add any glitter that you want. Find the Jelly Fish on the paper collection and die cut. The die fits perfectly so if you are not a stamper you can use the images on the paper. I also cut one of the fish as well. Choose sentiment and diecut using Luggage and Tags die. Now you are ready to decorate. Decide where you want the elements to go and adhere them and the card is finished. This is a very easy card for the end result to be so wonderful. I hope you try this as it has a huge WOW factor. Instructions: Take a 6" x 6" card base & ink it lightly with Seedless Preserve distress ink. Take 2 pieces of white cardstock, 6" x 6" and 6" x 5 3/4". Die cut the top & bottom edges of the 6 x 6" using the scalloped border dies from Classic Border Basics collection. Ink the die cut edges of the larger piece using Seedless Preserve Distress ink. Die cut top and bottom of the second piece (6" x 5 3/4") using the plain edge die from same collection. Emboss the smaller piece using paisley embossing folder. Layer & adhere both the pieces as shown on the card base. Die cut 2 eyelet ovals & a plain oval using white cardstock & the dies from Eyelet Oval and Basics Small Dies & Eyelet Oval and Basics Large Dies. Ink the larger eyelet oval & plain oval die cut lightly & the smaller eyelet oval die cut heavily using Seedless Preserve Distress ink. Stamp the sentiment from All Things are Possible Cling Stamp Set using Versamark ink & heat emboss it using Ranger Gold Embossing Powder & Ranger Heat-it Tool. Color the word 'HIM' with Seedless Preserve Distress ink & a paint brush. Layer & adhere all the three pieces using foam adhesive. Die cut 2 pieces of white cardstock using the decorative die from Festive Holiday Die. Ink them with Seedless Preserve distress ink. Glue them to both the sides of the oval arrangement & adhere them to the card front. Stamp the flowers from Classic Rose Cling Stamp Set using Worn Lipstick Distress ink & die cut using matching dies from Classic Rose Die. Color them lightly using Worn Lipstick & Squeezed lemonade Distress ink. Stamp the leaves from Open Leaf Cling Stamp Set using Forest Moss Distress Ink, die cut them using matching dies from Classic Leaf Die & ink them using Mowed Lawn Distress ink. Shape the flowers & leaves using Deluxe Flower Shaping Kit. Add pollens to the flower centers. Arrange & adhere them on the card as shown. Add some pearls to the die cuts for finishing touch. Instructions: Visit this link to see the inside pages. Cut papers from the Sugar Hollow Paper Collection to cover all of the pages…both sides. 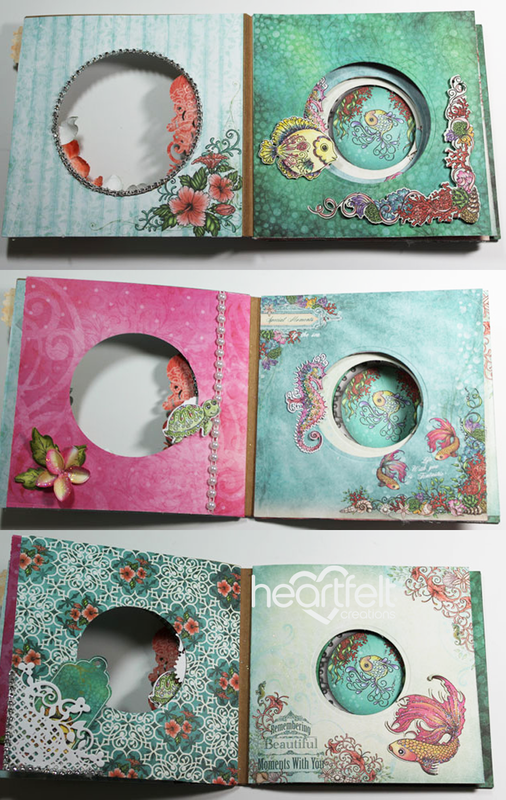 Die cut the circles for each page with the new Circle Basics Dies. Ink the edges of the designer papers and adhere to the pages of the Layered Circles White. Adhere the pages to the book base. Stamp the birdcages with VersaMark, heat emboss with Silver Embossing Powder and die cut with coordinating dies. Stamp the owls, tree swing, leaves and flower cluster from the Birds and Blooms Collection with Memento Tuxedo Black, color with Zig Clean Color Real Brush Markers and cut out using coordinating dies. Stamp the flowers from the Birds and Blooms Collection with Brilliance Pearlescent Orchid Ink, color and cut out with coordinating dies. Shape everything with the Deluxe Flower Shaping Kit, add Sweet Shoppe prills and glitter. Adhere to the layered card as shown. Cut tags from the paper collection, ink the edges, add glitter and adhere to the layered card. Die cut the decorative accent from the Festive Holiday Die twice, add the circle image from the card front in the paper collection. Glitter and adhere to the last page. Assemble box and add panel from patterned paper to back of the box. Cut a piece of pink striped paper 4 1/2"x 3 1/4" and die cut an opening using the inner die from the HCD1-7148 Window Frame Die. Adhere to the front of the shadow box. Stamp the window frame from the HCPC-3794 Window Frame Stamp Set in Tuxedo Black on white cardstock, and die cut using the coordinating die. Die cut the decorative filigree die and the arch from the HCD1-7150 Window Box Elements Die. Cut the decorative filigree die in half and adhere to each side of the window. Adhere the window frame die to the top of the window. Cut 2 pieces 1/2" x 3 1/4" from the pink striped patterned paper to coordinate with the front of the shadow box, and add to the top and bottom. Cut 2 pieces 1/2" x 4 1/2" from the pink striped paper to coordinate with the front of the shadow box, and add to the sides. Adhere the shadow box to the base card. Stamp the candle image from the HCPC-3794 Window Frame Stamp set in Stazon Black ink on Bristol Smooth cardstock. Colour in with the Zig Clean Colour Brush markers. Die cut using the coordinating die and add dries white glue and frosting powder to the leaves and adhere to the window ledge. To make the poinsettias stamp the images from HCPC-3745 Ornate Sleigh stamp set using Frost White on vellum. Emboss with Bridal Tinsel embossing powder. Sponge the back of the flowers with Pearlescent Coral ink and the leaves with Bamboo Leaves and die cut using the coordinating die. Shape using the Deluxe Flower Shaping Kit and and assemble using Dries Clear glue. Add Minnie Pearl Prills to the centre of the flowers and adhere to the bottom right and top left as shown. Cut the sentiment from the patterned paper and adhere to the top of the card as shown. Instructions: To see the inside pages of this layered card click here. Construct 5 X 7" layered card then cut designer paper for each side of each page (sponge edges of all pages). The first page is the largest oval and they get smaller as you go. For the first page, in order for the window frame to fit, you need to cut the designer paper with a rectangle (large enough for the window) a bit smaller than the opening. Before gluing front piece of designer paper, glue a piece of ribbon about 8 or 9" hanging over the edge, then glue your "cover" page on. On each oval opening I also cut an oval frame from designer paper using two oval dies to create the frame. Stamp and die cut the window from white cardstock using black ink on white cardstock. Die cut Window Box Elements (decorative pieces) on white cardstock and cut the larger decorative piece in half lengthwise (these will be the shutters). Glue window, shutters and topper onto the front cover. Stamp, die cut and color holly and cardinal (several pieces are used throughout) using black ink on white cardstock, coloring with Copic Markers, form slightly then add the Crystal Clear glitter. Stamp, die cut and color the sled, color using Copic Markers add some bakers twine as a pull rope. Pop the sled up against the "wall" next to the window. Add the holly and cardinal to the left side of the cover. Glue the window to the opening. Page 1, cut the oval frame from designer paper and glue to page. Add a holly garland on top of both window and fussy cut the little girl (she is looking at the tree!). Die cut four Fleur and Border Pockets onto white cardstock add these double pockets at the bottom of both pages. Stamp "Twas the night before Christmas" using black ink. Die cut with Spellbinders A2 Rectangles adding a mat behind it. Page 2, this is just designer paper, oval frame and poinsettias (stamp, die cut and sponge poinsettias with Angle Pink then form flowers and add Prills). This page also has the Christmas tree in the oval and poinsettias also a little sentiment "ticket". Page 3, has an oval frame alone with Holly & Berries in two corners. Die cut Regal borders from white cardstock and adhere one on each side. Stamp fireplace image using black ink on white cardstock. Diecut with oval die and color with Copic markers. Add oval frame on top of this image. Page 4, die cut a double Blossom Corner from white cardstock and the last page has a single Blossom corner. Both the double and single are pockets, only add glue to 3 sides. Die cut tags from designer paper using the luggage and tags die, add bakers twine. Cut a panel of your choice to tuck into the pocket. Add a poinsettia to the top right. The back cover has another piece of ribbon glued between layers allowing you to tie the "book" closed. 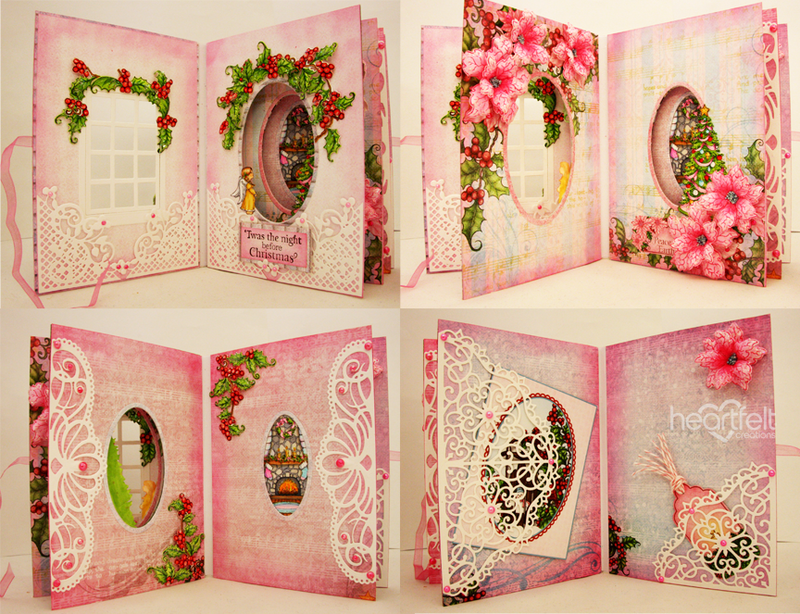 Add Nuvo Carnation Pink drops throughout book as shown on die cuts. Allow to dry. Instructions: The finished size of this slider card is 6 1/2" x 5 1/4"(17 cm x 13.5 cm) Taking the white cardstock make a card base. Cut 10 1/2" x 5 1/4" (27 cm x 13.5 cm) and make two 2" (5 cm x 2 cm) folds along the longer edge. Cut a slider at 1.65" x 3.65" (4.2 cm x 9.3 cm) the card front cut at 3.85" x 5.85" (14.9 cm x 9.8 cm). Find the pink coloured designer paper with the music print. Cut the matting a little smaller than the white cardstock. Adhere all to the card base. Find the designer paper with the white music print from the collection and use this to cover the box. You will find the die to fit the hole size in the Cut Mat Create set. Adhere the paper to the box shape then die cut the hole with the die. Don't forget to tape the die in place! Ink the hole edges with the Victorian Velvet ink. Find the background paper used inside the shadow box in the collection. It is the oval shaped card front print with the pink poinsettias, berries and holly leaves. Cut to fit the box size. Fussy cut a few poinsettias from the papers and adhere with foam 3D dots to the side of the oval. Die cut four sentiments and four fancy borders from the white cardstock. Apply the crystal clear to all die cuts and allow to dry. Adhere 2 of the border die cuts to the inside sides of the box, one on each side. Continue to secure the box shape with the background in place. Adhere the box to the card front using hot glue. Take the remaining 2 prepared borders, adhere on the outside of the shadow box, on either sides. Adhere a fussy cut poinsettia flower cluster along the box of the opening. Stamp using Victorian Velvet ink on white cardstock die cut 3 double small size poinsettias and diecut. Colour using same ink and daubers, shape using the Deluxe Flower shaping kit. Place them on top of the flower cluster to the right and onto the card foot base. Apply the Wedgwood blue gloss to the flower centres. Put aside to dry. Taking the Cut Mat Create die set, find the leaf swirl and die cut 2, colour and shape. Adhere under the poinsettias on each side. Adhere the sentiment layers together, to create a thicker 3d piece and then adhere across the box front. Make the triple bow and adhere to the top of the box with the glue dot. To finish apply the Diamond Stickles to the flower petal tips and centres. Instructions: To see a close up view of this layout click here. The mauve cardstock is your back ground. Cut the light pink patterned paper to 11.5 x 11.5" and distress the edges. Adhere these layers together. Add the pink border strip to the top of the layout cutting it down to 11.5”. Cut a strip of the striped patterned paper that is 1.5 x 12" and adhere it across the middle of the layout. Cut a strip of the corrugated paper that is 4 x 12" and tear the bottom edge on a diagonal. Adhere it slightly to the left of centre of the layout. Die cut a scroll from white cardstock and adhere it to the top of the corrugated paper using mini glue dots. Add a couple of pearls and a button. Die cut one of the decorative lattice pieces from kraft cardstock and cut it in half, adhering a piece above and below the striped border on the right. If you were to number the circle dies from smallest as #1 and work your way up. I used the scallop cut from white cardstock as the largest layer. Cut the patterned paper layer from #7 of the Large Circle Dies, cut a white circle using #6 of the Small Circle Dies and I used the #6 from the Large Circle Dies for my photo. Adhere the layers together and add to the middle of the corrugated strip using 3D foam squares. Stamp and die cut 10 of the large clusters of leaves. I added colour using my Chameleon pens. Stamp and die cut 9 of the mistletoe images. I added colour to it using my Chameleon pens. Stamp and die cut 1 set of Sparkling Poinsettia and add colour using ink and daubers. Shape all of your pieces. Assemble your larger poinsettia. Add beads to the middle of both flowers using 3D Crystal Lacquer. Let dry. Add Stickles to the tips of all of the petals. Let dry. Start adding the leaves and mistletoe in a tight circle around the matted photo to form the wreath. Alternate images and add in both of your poinsettias. Add buttons here and there to cover any spots that look a little sparse or messy. Find and cut out the sentiment “Twas the night before Christmas”, flag one end and adhere to the right of the wreath. Add a few more pearls here and there. Instructions: Click here to see the inside pages of this layered card. Construct 6 x 6" layered card then cut designer paper for the front and white cardstock for each back side of each page (sponge edges of all pages). The first page is the largest circle, this is also the cover of the album. I stamped the hibiscus flowers and leaves with black ink and then I colored the flowers with the Rose Bud and Fossilized Amber in the middle. I colored the leaves of the flower with Bamboo Leaves. Die cut with coordinating dies, shape using deluxe flower shaping kit, then I glued some Eiskristals in it. I also stamped, the coral, a seahorse with black ink on white cardstock and diecut with coordinating dies and colored images. I used a quote from the designer paper for the front, cut and matted with another layer of designer paper. Then on the back of each page I glued a piece of Acetate and Then I put 2 water plants on the back, then I covered the back of the page with white Cardstock to cover the acetate, and you also can glue some items on it like the clear water drops I made them with the Pearl Pen Clear. For the second page I cut out an extra circle of the small Circle die set The biggest one with the scallop and the 3th one, if you cut them together you get a frame now glue this on your 2nd page and make dots with the white pearl pen. Stamp, color and cut the jelly fish, put some eiskristals on it and glue him on top of the frame, decorate the page also with those Eiskristals. Put some clear drops on the acetate, and cover the back with the White cardstock. For the 3rd page, I stamped a fish with gold embossing powder colored, cut it and I put it on the page glue some acetate behind it, then on the back I glued a piece of Coral and then the cover with white cardstock, on top of the acetate some clear drops. For the 4th page I made another fish, I cut out some shells from the paper and put them on glue dots so that they look 3D, behind it I put a piece of coral then acetate on the back, clear drops and white cardstock on the back. For the last page I only used a piece of the paper with a nice image, I decorated it with Eiskristals, and clear dots. Instructions: The 6 x 6" circle card comes with the circles already cut in the card base panels. Sort the panels with the largest circle on top and nesting to the smallest circle. Select the papers from the Tropical Paradise Collection that you want to use on each panel. You may want to coordinate the panels that face each other when each page is opened. 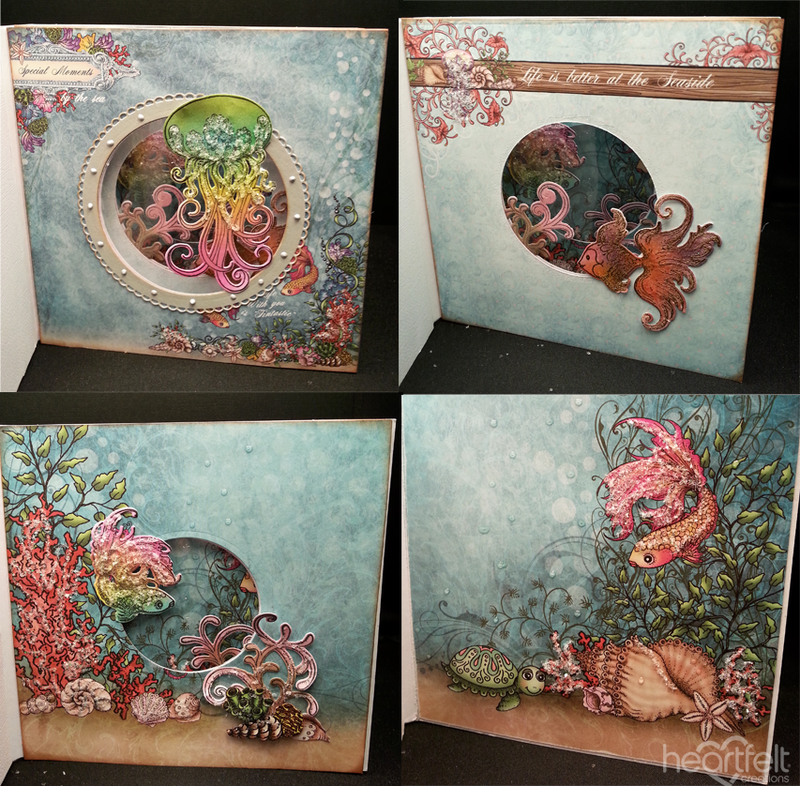 The Circles Card is 6 x 6" so I cut my Tropical Paradise paper at 5 3/4 x 5 3/4". This will provide a 1/8" border around the edges. Sponge the edges of the paper with Peanut Brittle Ink. The paper was applied to the panels that would be on the right hand side. The Basic Circle Large Die was secured in the precut circle with repositional tape. This process was repeated for each panel on the right with the appropriate nesting die. The last page was a solid 5 3/4 x 5 3/4" panel without a circle. The right sided panels were applied to the top of the bookbinding flap of the card base with double sided tape. The designer paper was then adhered to the left side of each panel. Secure the die in the appropriate circle opening and then sandwich the page with the die between two cutting plates. The rest of the pages will hang off the foot edge of the cutting plate. Doing it in this order allows the 1/8" margin to be consistent for each page. I did not have any problem running the die through the panels with my Vagabond 2. The bulk of the panels will not have any pressure because only the panel with the die will be sandwiched by the cutting plates. The front panel had the eyelet die cut with apricot cardstock by nesting the eyelet and the next size smaller together. The eyelet trim was added to the top of the circle. Stickles were applied to the eyelet embellishment. I added a decorative paper to the back of my card but that is totally optional. The flamingos, cockatoo and various leaves were stamped with black ink on white cardstock. They were colored with the following Copic color combos (Cockatoo - C1, C2, C3, Y11, RY21, YR23, YR27, and black colored pencil, Flamingo - RV10, RV23, YR00, YR18, YR21, YR23, C1, C3, C5, C7, Leaves - G40, G46, YG17, YG11, YG61, YG63, YG67). Each image was die cut with the coordinating die. Additional images were cut 3 times from green cardstock and adhered with dries clear glue for strength. The images were applied to the card base with double sided mounting tape. The plumeria were stamped with Abandoned Coral Distress Ink. The flowers were sponged with the Abandoned Coral ink. The leaves were already colored with Copic markers but the edges were also sponged with Cottage Ivy Ink. The flowers and leaves were shaped with the Deluxe Flower Shaping Kit. Clear Crackle was applied to the leaves and petals and sprinkled with frosting power. The leaves and flowers were heat set. The flowers were applied with a glue gun. The tunnel card was embellished with rhinestones. Instructions: My card is 5 X 7". 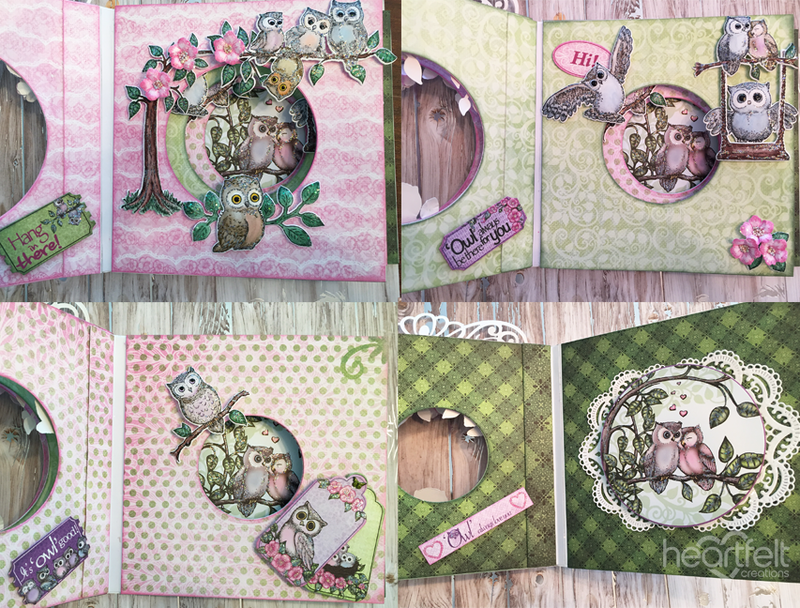 Make card base and cover with a piece of the paper collection. Cover the edges of the shadow box with the paper collection before you make the folds actually make the box. Once the shadow box is covered, glue it just around the edges and adhere it to the card. The fourth side is left open so you can slide the tags inside. Now stamp, die cut, color and glitter the hummingbirds and butterfly. Stamp, die cut, color and shape the flowers and leaves. Glue everything down and allow to dry. Cut out the tags from the paper collection and tie the fiber through each one. Slip them down behind the box and your card is all set. together except on one side. Choose another panel for the back of the shadow box. Cut and adhere to inside of shadow box. Glue finished shadow box onto your card. Add sentiment from your papers, cut and adhere on top frame of shadow box. Instructions: Project measures 6" x 6". Cut 9, 6" x 6" pieces from the Blazing Poppy Paper Collection using various patterns and colors. Cut openings using Circle Basics Large Dies. Ink edges with Rhubarb Stalk and Bamboo Leaves Inks using Stack and Store Daubers. Glue all papers down with Designer Dries Clear Glue. Die cut eyelet circle using Eyelet Circles and Basics Small Dies first 2 dies with Black cardstock 2 times. Glue to circle on front and again on back of first page. Stamp Blazing Poppy Petals Set on reddish designer papers with Onyx Black Ink. Cut with matching Blazing Poppy Die Set. Stamp leaves on green designer papers with Delightful Daisies Set using black ink. Die cut with matching Delightful Daisies Dies. Ink edges of flowers with Rhubarb Stalk Ink and leaves with Bamboo Leaves Ink. Mist backs of flowers with water using Misty and shape using the Deluxe Flower Shaping Kit. Make various flowers glue 2-3 together, offsetting petals. Shape leaves with fingers. Arrange as pictured, glue in place. Add Ebony Microbeads to flower centers. Instructions: To make this 6" x 6" layered card start by choosing the paper that you want to use. I am using the Sunrise Lily Paper Collection. Trim the paper you selected for the panels down to 5 3/4" x 5 3/4" and center the correct size circle die in the center. Tip: To ensure that I was die cutting in the correct place I placed the paper onto the panel and from the backside traced around the circle opening. Then taking 2 panels I die cut both and then trimmed them down to size. Then, simply repeat this for every layer. Once you've accomplished that, now you can start decorating! All of the images I used were stamped on white card stock using Watering Can ink before die cutting with the matching dies. The sunrise lily images and sunrise lily flowers were colored with Pebbles Metallic Cream Chalks and then shaped with the Deluxe Flower Shaping Kit. Finally I accented the stamens with Hot Mama Prills. Instructions: Construct 5 X 7" layered card (White) then cut designer paper for each side of each page. Distress all the edges of all pages. Sort the panels with the largest oval on top and nesting to the smallest oval. Select the papers from Festive Holly Collection that you want to use on each panel. You may want to coordinate the panels that face each other when each page is opened. To create the windows, tape down the selected designer papers back to back, align the Eyelet Oval and Basic Large Die and run through the die cutting machine. The papers were glued to all the pages on all the sides using appropriate nesting oval die, except the last page which is solid. I also cut an oval frame on white cardstock using two oval dies. The back side of the album has a pocket which can hold tags for journaling and photo mats. A decorative border was cut from a smooth white card stock which is then glued on the top of the tags and photo mats. On the second last page, cut some tags, layer them outwards as shown and tie a seam binding ribbon (painted using Festive Berry) to add an extra accent to the project. The images from Wheel and Classic Wedding Bells Cling Stamp Set is stamped with black archival and colored using Zig Clean Clear Markers. Die cut the images using their coordinating dies. Also, the images from Festive Holly & Cardinals Cling Stamp Set are stamped with black archival ink and colored using Zig markers. The images are cut using Festive Holly Cardinals Die. Stamp the images from Frolicking Frosty Spruce using black Archival and paint with Zig Clean Clear Markers. Color body and shoes with 030 and 034, scarf with 031 and 033, cap with 060, 065, 061. Die cut the images using its coordinating die. Stamp Deer image on white cardstock and using black ink and diecut. Color using Zig Markers. Die cut several layers of the Fesitve Holly Arch on white cardstock and adhere together to create a thicker 3D piece. Die cut oval sentiment tag using Luggage and Tags die and adhere onto card front. Add dries clear glue on images as desired and add Crystal Clear and Frosting Powder as desired. Arrange pieces as shown and adhere using dries clear glue. Instructions: Finished size of tag is 5 1/2” x 9 1/4”. Take manila tag and trace shape on patterned paper and chipboard. Cut and ink edges with Weathered Wood Distress ink, glue patterned paper tag to manila tag, glue this tag to the chipboard by only applying glue to the top, left and bottom sides, leave right side open to create pocket for sentiment insert. Take small shadow box and decorate with coordinating patterned paper on front, and sides. Cut a panel from one of the scenes on the patterned paper to fit inside the box, glue in place. Add little dots of glue and sprinkle frosting powder, use the heat tool to make the frosting powder more white. Cut a piece of clear cardstock, score sides and fold over (about 1/8” on each side), apply little dots of glue and cover with frosting powder, heat for whiter finish. Glue panel inside of shadow box as pictured. 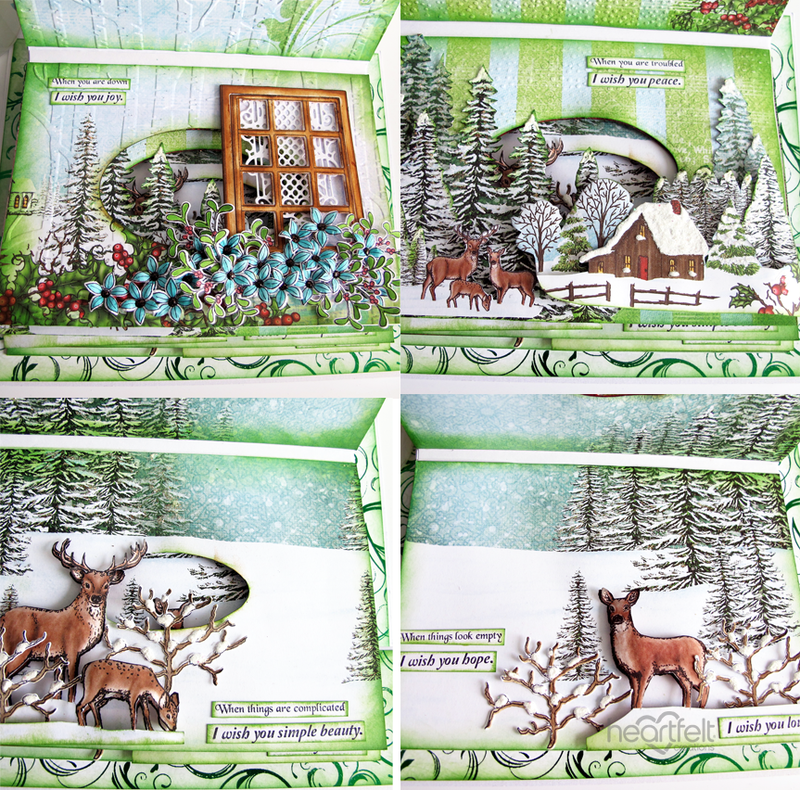 Using scissors cut the little image with pine trees and deer, glue on top of clear cardstock with foam dots. Glue shadow box to front of tag. Stamp 3 lanterns, and several holly branches with cardinals on watercolor paper with black ink, cut with coordinating dies, color with Real Brush markers and water brush. For the lantern, base image is complete, second image - cut out the candle panel and right hand side small panel, third image - keep only the top portion of the lantern, glue together with foam dots for dimension. Stamp several poinsettia flowers on white cardstock with black ink, cut with coordinating dies, color with lipstick red ink and shape with flower shaping tool set. Glue pieces as pictured. Cut sentiment and mat with white cardstock, glue to tag with foam dots. Die cut 2 decorative shapes from white cardstock, glue one to top of tag. Cut one sentiment panel from patterned paper, ink edges with weathered wood, glue second decorative diecut to back of panel, mat with white cardstock and insert in pocket. Make bow, add jingle bells and gold cord, glue to tag. Add frosting powder and heat emboss to show more of the white. Instructions: The finished size of this slider tunnel card is 8 1/2" x 1" (13.5 cm x 15 cm) Click here to see the inside pages of this layered book. The card front for this slider card is 5 1/2" x 7" (14 cm x 17.7 cm). Once you have made the card base, find the matting paper in the paper collection. Cut this a little smaller than the card base. You will only need to cover the card front 1" (2 cm) down as the tunnel card book will be adhered to the rest of the card front base. Cut from the design paper 7" x 1" (17.7 cm x 2.4 cm) for the tunnel card book spine. Using the Mowed Lawn, ink all the edges of the design paper that will be showing. Adhere the prepared design paper in place. Put aside until you have completed the tunnel book card. Adhere the design paper to the tunnel book card spine, covering the spine and a little on the front. Here starts the fun! How to make the whole in the pages: Chose two papers for each page remembering you have a main page and a top page which I did not decorate for this card. Once the pages have been chosen and are cut to size, place the page onto the design paper and trace around the whole. Find the die to fit the oval whole and tape in place before die cutting. Place the tape to the inside of the oval in case the tape rips the paper when taking it off, then it will not show. Tape well as you do not want this to move in your machine! Emboss the papers you want embossed with the embossing folders. You can use either wet glue or double side tape to adhere the pages together and into the bookbinding. This project was started with the front page then went to the back of the book and worked forward. You can do what ever suits you. Note, there is no oval hole in the front page because it is covered; this is so it will look like a book cover. Take the largest oval die with the fancy edge and cut out from the front page. Cut a smaller oval. Cut a few extra from white card stock and adhere together so the ovals will be very firm and will not bend. These will be adhered back in place with foam 3d dots after the edges are inked with mowed lawn ink. Apply the white drying glue to the roof and water wheel then apply the crystal clear glitter. Leave to dry. When this is dry adhere on place once all the pages are done. Find the twin paper and fancy cut the two cardinal birds. Apply the glue and glitter to the snow on this fussy cut. This will also be later adhered with 3d foam dots. The berries are highlighted with a few drops of Red Berry crystal gloss drops. The sentiment is stamped onto the white card stock, cut into strips and the edges are inked. Two lines are adhered to each page of the book. The back page: Find two of the designer papers with the large deer on it. Fussy cut the deer from one of these papers. The fussy cutting will be used for two pages. Stamp, colour and die cut the twigs from the window fillers sets. Make x4; apply the glue and glitter to the snow on the twigs. Use the same paper for the background. Adhere to the back page. Adhere the prepared sentiments. Use the remaining deer for the next page, building the picture as you go. Do the same for the remaining pages planning and fussy cutting as you go. Not forgetting to apply the glue and glitter before adhering the page to the book. It takes a little longer but then glitter will not get to where it is not wanted. The page with the window: This is stamped and die cut an extra 5 times. Adhere together then ink the window frame with vintage photo. Die cut the fancy frame from the window box elements die set from whit card stock to use as a window curtain, adhere to the back of the window frame before adhering the frame to the page. Stamp the flowers and mistletoe branch for the foot of the window. Arrange and adhere in place. Adhere all the sentiment s to the pages. To finish, add stickles to the snow on the trees and snowflakes on the front page. Adhere the book to the card front. Make a large triple bow and adhere to the top of the slider with a glue dot. To finish the card, adhere the mistletoe branch and flower to the knot of the bow. Instructions: Click here to see the pages in this layered card. Stamp two sets of each of the Festive Holly and Cardinals images using Early Espresso ink onto white cardstock. Die cut and color the images. Select and cut five 6" x 6" images from the Winter's Eve collection. Glue to the cardstock bases. Select the appropriate size circle die cut and tape in place. Die cut the middle of each of the images. Adhere the cardstock pages with Winter's Eve designer paper images with circle, in descending size order onto the card base and on the last panel glue the bordered image with no circle cut out of the middle. Fussy the Christmas blessing message from the Winter's Eve paper. Die cut from white cardstock the window frame lacy piece. Arrange the die cut pieces on the sides of each of the circle panels. Using foam tape, adhere the window frame lacy piece and message to the bottom right corner of the top panel. Instructions: Take ready prepared card 6" x 6" from white cardstock, cut from Festive Holly Paper Collection matching pieces and glue it in to card. Take a small shadow box from the White Card Shadow Box Set and assemble, glue to hold together. Measure and cut out matching sizes from paper collection and glue it around box. Place onto card using dries clear glue. Die cut Festive Holiday Die from white cardstock and place on shadow box. Stamp with black ink, elements from Festive Holly & Cardinals Cling Stamp Set. Paint using water paints and die cut with coordinating dies. Arrange the leaves around window. Adhere using Designer Dries Clear Adhesive glue. Instructions: Take a cardstock size 7” x 10” and fold it to half (side fold). Final size is 7” x 5”. Now take a pattern paper from Winter’s Eve Collection which is 1/8" smaller and distress the edges and paste. Next take the Card Shadow Box Set-Kraft and fold it as per the scoring lines and a box will be formed. Die cut Window Box Elements from white cardstock. Add die cut-from Window Box elements die- half on the left and half on the right around the shadow box. Stamp background images from Winter’s Eve collections with archival ink-black on white cardstock and color with Zig Clean Color Real brush. Fussy cut around girl and tree for the front and trim down fireplace image for the back of the shadow box. Stamp the Sparkling Poinsettia cling stamp set flower with Rose Madder ink onto white cardstock and die cut with the coordinating die. Color with archival inks, Rose Madder and Plum. Shape using the Deluxe Flower Shaping Kit and create three poinsettia flowers. Sprinkle with diamond dust, and at the centre add golden beads. Next stamp the Window Box Filler stamps with Plum Archival ink on white cardstock. Diecut with coordinating dies. Color with Archival Inks Buttercup and Plum, sprinkle with Crystal Clear Powder using Glossy Accent. After making all these elements, arrange as shown and adhere. Next stamp the from Festive Holly and cardinals cling set on white cardstock using black archival ink. Die cut using their coordinating dies and color with zig clean color real brush using 020 red, 053 yellow green, 048 emerald green. Now add a sentiment from the pattern paper and fussy cut, and paste it as shown. Instructions: Click here to see some of the pages inside. Begin by choosing the paper you wish to use, trim down to 5 3/4 x 5 3/4" for each page (total 0f 9). You can cut 2 at a time by placing them together and the correct size circle, after everything is cut out adhere to the card pack. Stamp the grapes image on some of the purple paper from the Italiana Riviera paper, with Black ink, color the edges lightly with Wisteria ink, die cut and shape. Stamp the leaves on some of the Green paper form the paper pack, die cut, high light the edges with Bamboo Leaves, shape. Stamp the flowers on white card stock, color with the Cantaloupe and Wisteria, die cut and shape. On the larger leaves place D-Dots to help hold the shape. Adhere everything to the card booklet. To finish add Crystal Clear to the flowers, leaves and grapes, add Prills to the center of each flower. Instructions: Card is 6 x 6" on white card with card panel cut from Winters Eve Collection. Stamp and die cut all your elements: Cardinals, 8 sets of mini poinsettias, wreath, lamp post in Vintage Photo ink on white cardstock. Color with distress inks: Aged Mahohany for flowers, Peeled Paint for leaves, Wild Honey and Vintage Photo for lamp post. Mold flowers and attach pollens, then attach to holly leaves. Stamp sleigh in Tahiti ink and die cut. Fold shadow box on all score lines and use Cut Mat Create Die to cut paper to fit shadow box. Cut other papers in 1/4" widths to cover top bottom and sides of shadow box. Cut a second panel to go inside the box (approximately 5 x 5"). Using luggage and tag die, die cut two tags, ink edges with vintage photo at attach brads. Attach these to back of the shadow box. Adhere all elements as shown, with sleigh on outside of box, lamp post and one cardinal set on inside of box popped with foam adhesive. Cut wreath in half and drape across the sleigh as shown and attach mini poinsettias and holly leaves as shown. Detail all with crystal clear and frosting powder. Attach box to center of card. Every time I think Heartfelt Creations can't possible create something more beautiful you create yet another treasure that I fall in love with. Layered Cards, Shadowboxes, wow just gorgeous! Thank you Heartfelt Creations! These are so inspirational. I only found Heartfelt this past year but have built up a great collection and can hardly bear to leave my craft room. Your designs are so beautiful with your dies stamps and papers.. Love your videos Emma Lou. I was beginning to get a bit bored with papercrafting but you have renewed my enthusiasm. Many thanks. I'm amazed with this collection ! You keep coming up with better and better ideas ! Thank you Heartfelt !!! WOW! Truly amazing all of the designs. Thank you for sharing with us, we love what you create! Absolutely love Angelina Turner's card!!!!! Sandra Carey's card also! Very beautiful. ABSOLUTELY OUT OF THIS WORLD ! The time and effort your group of artists put into these cards is something to be shouted to the world ! ! THANK YOU ALL FOR YOUR VALUABLE TALENT AND SHARING IT ! ! ! Hello my friends! Greetings to you from Cedar Rapids, IA! How I wish I could order the bundle today. Everything is simply wonderful. Unfortunately my hubby spent a lot of money on me for my birthday last week. But I will order a little at a time because all of these items you have have shown us today will take my cards to a new level. While I've made many shadow box cards from scratch before it is nice having them already made and in different sizes. They will fit into the envelope boxes I make. I don't know if you can tell I'm really excited about this new release! Thank you to the Design Team for all the gorgeous cards and projects you made. Your creativity is a wonderful blessing to us all!!!!!! Every one of these cards belongs in a museum! Absolutely gorgeous! 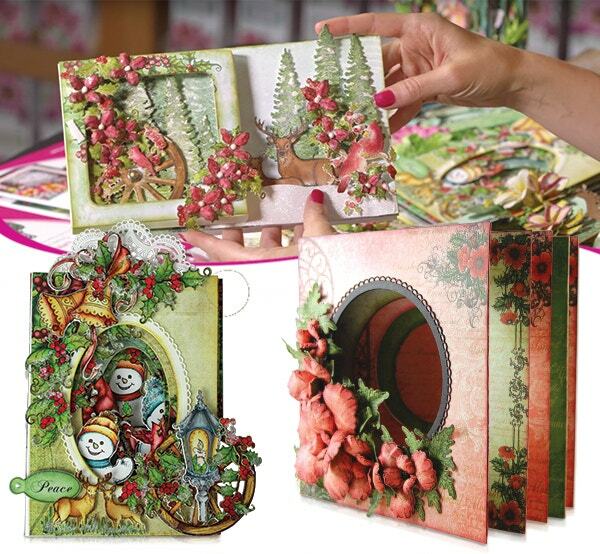 Love that every artist is so uniquely different - Tracy's wreath layout, Janet's sugar hollow layered card, Susan's stunningly realistic looking woodland winter layered book and the rhinestone bling on Candy's pampered pooch mini album is very clever. So many wonderful new ideas to try out for myself! So much inspiration here....wonderful projects. I've already watched the first video twice and plan to do so again today with my crafting friend....we have a very special project to make for a friend whose birthday is coming up....I think one of these projects will fit the bill. Fantabulous!!! So much information I don't know where to start first. I want to just run out and purchase all the new items for my craft area and learn to use all of them. Your tutorials (both written and video) are extremely informative and inspiring to the Nth degree. I can't think of anything that has gotten me so excited about producing my own cards in at least the last 10 years. Your ideas take my breath away!